Special talents: Can project a shield with her mind. Family members: Mother – Renee Dwyer, Stepfather – Phil Dwyer (PC4) Father – Charlie Swan (TW1) Married to Edward Cullen. (BD3) Natural mother to Renesmee. (BD18) Part of the Cullen family. 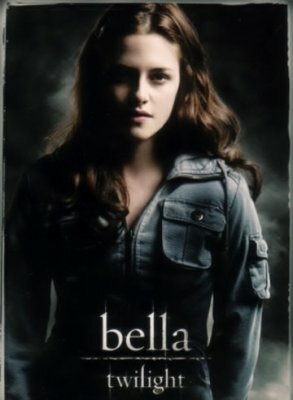 Personal history: Bella was born in Forks, but her mother and father split up when she was six months old. (TL) She spent the majority of her young life in California (TL) and then later Phoenix, Arizona where she wasn’t very popular and never felt as if she fit in. She is far too clumsy for her own good and tries to avoid sports and dancing. A few days shy of her nineteenth birthday, Bella’s placenta dethatched and the baby fought to be born. In the process, Bella’s spine was broken, leaving her paralyzed and unable to feel anything from the waist down. Since Carlisle was away, Edward was forced to deliver the baby on his own. Jacob stayed in the room for support. (BD18) Wracked with pain, all Bella knew was that her baby was in danger. She begged for Edward to get the baby out, which required him to bite through the strong wall of the placenta. Wanting to hold her baby, which was a girl, just once, Bella reached for her. But when the child tried to drink from Bella, Edward gave the baby to Rosalie to tend to.